If I could have read this book 20 years ago when I first announced I wanted to be a farmer by laying claim to five acres of my own at the end of a dirt road in Idaho, I wouldn’t have felt so utterly alone at times—alone when I couldn’t manage my bills, alone when a banker asked if there were any men in my life who would be willing to co-sign the agricultural operating loan I had applied for, alone after chopping thistle for days in the pouring rain or searing sun, alone when an unprecedented flood washed out my crops and mile-long road. Today, women are the fastest growing group of people buying and operating small farms. While the number of American farms has dropped 14 percent in the last 25 years, the number of farms run by women has increased 86 percent. At this rate, some predict that within another 10 years, women may own as much as 75 percent of the farmland in the United States. Like a tenacious new breed of invasive weed, we’re here to stay, laying down roots and growing right where we’ve always belonged. The 17 women profiled in this ground-breaking book are typical of this “new breed,” this “different” kind of farmer the media is talking about. Our approach to agriculture is more holistic and systematic. Instead of buying what we can spray from a nozzle to fix a problem today, we take the long view. The homemade farm sign at the beginning of my lane says: “Living like we’ll die tomorrow, farming like we’ll live forever”. 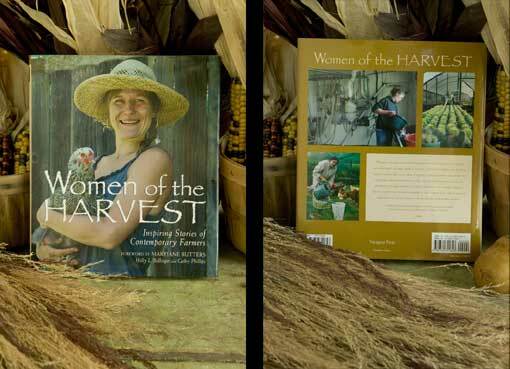 From the women in this book, you’ll learn that women farmers aren’t interested in commodity agriculture and the latest new chemical or genetically engineered wonder. We’re not dreaming of endless frontiers. Instead, we’re giving new meaning to the term “value-added.” We’re expanding the boundaries of food distribution and the definition of farm. We’re pushing the limits of marketing. We’re busy feeding our neighbors and friends and families through Community Supported Agriculture programs and at farmers’ markets. With incredible ingenuity, we’re feeding our creative urges. When we raise lambs for sale, we give lessons on spinning and knitting. When we grow the ingredients for salsa, we hold Latin dance clinics. When we promote the sale of our crops as ingredients perfect for pizza, we plant our vegetables in wedges that form a grand circle when seen from afar. When we grow 60 different sunflower bouquets, we take photos for a line of sunny greeting cards. When we decide to convert land into native prairie again, we turn it into a business that sells and promotes endangered native plants. When we open up our hearts, we open up our homes and turn them into bed-and-breakfast sanctuaries where our guests are fed the best food on earth. We’re all over the Internet, blogging and advertising our food. We make handmade goods, such as wooden clothes racks and button jewelry to supplement our farm incomes. We’re active participants in problem-solving Internet chatrooms. We’re notorious seed savers. We love to grow heirloom varieties of plants. We milk 6 to 60 cows, not 6,000, and we’re known for our artisan cheeses. We’re the spirit of the beehive and we love ventures that allow us to cross-pollinate ideas with other women farmers. We’re a force—a force of nature. We’re drawn to farming because of the sensory, tactile nature of it. We want to feel our lives and taste them and truly live them. I predict that in the same manner historians refer to life before and after the industrial revolution, we’ll go down in history as key players in the new millennium’s farming revolution, to be known as the era at the turn of the century when women collectively changed the face of agriculture. If you’re a land-poor female farmer longing for your place in the country, take heart. The types of ground-breaking women featured in this book are creating a growing demand for local, hands-on food. Or like 95-year-old Eloise Stewart, the matriarch of a tree farm located in Florida, raising the business bar by creating one of the best-managed, environmentally sensitive tree farms in America. I call them “intimate crops,” or one-on-one food. Twenty years ago, not enough people in my locale cared that my bell peppers, pickling cucumbers, canning tomatoes, and garlic were organically grown and nurtured from start to finish with love and care. What mattered most was the price. What matters now is the name, it’s MaryJane’s garlic. Agriculture is changing—a change that has a female voice, not just from female farmers, but from mothers concerned about safe food and women who’ve come to realize how much better they feel when they eat better. But the backbone of a kinder, gentler agriculture has been strengthened by people like the pioneers in this book, women who can’t resist the nurture part of their nature. Admittedly, some of the changes have been hard-won, but after 20 years, I can fervently claim the rewards pile up faster than manure! Women who give in to their farm fantasies (I’ve never met a woman yet who hasn’t, at some point in her life, had a farm fantasy) are in for a sensory journey like none other. Digging in the soil makes you whole. It’s as simple and as complicated as that. As our numbers grow, so does the abundance of opportunities and ideas. Sit back, read, and be inspired. There’s a whole new frontier awaiting us, but it starts here, armed with the inspiration of women farmers who’ve already landed their dream.